The conviction of three Al Jazeera journalists yesterday underscored the hypocrisy of US support for Egypt’s General Abdel-Fattah el-Sissi. A day after chatting it up in Cairo on Sunday with now-elected dictator General Abdel-Fattah el-Sissi, who, Kerry assured the world, “gave me a very strong sense of his commitment (to) a re-evaluation of human rights legislation (and) a re-evaluation of the judicial process,” the secretary of state felt compelled to release a statement condemning that process. Today’s conviction and chilling, draconian sentences by the Cairo Criminal Court of three Al Jazeera journalists and 15 others in a trial that lacked many fundamental norms of due process is a deeply disturbing set-back to Egypt’s transition. Injustices like these simply cannot stand if Egypt is to move forward in the way that President al-Sisi and Foreign Minister Shoukry told me yesterday that they aspire to see their country advance. That was followed with some human rights blather by Kerry that the various military juntas that have run Egypt into the ground for more than half a century have systematically ignored. One can only imagine the depth of fear experienced by the Egyptian leadership when Kerry registered his disapproval of the court decision: “When I heard the verdict today I was so concerned about it, frankly, disappointed in it, that I immediately picked up the telephone and talked to the foreign minister of Egypt and registered our serious displeasure at this kind of verdict,” he told reporters in Baghdad. Not soon enough to assure the military junta that has continued to imprison President Mohamed Morsi, who appears in court locked in a soundproof cage, and that the day before Kerry’s visit confirmed the death penalty for 182 of his supporters in a mass trial. 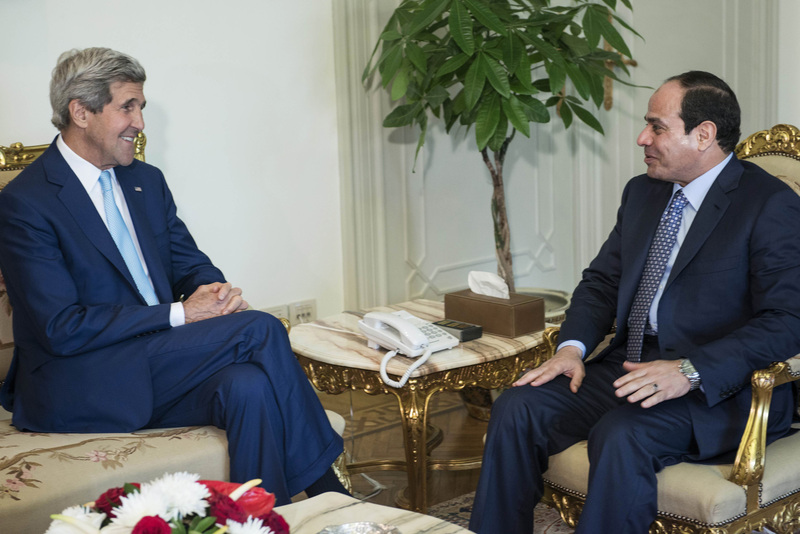 Although hundreds of other defendants also face the death penalty, and tens of thousands of Morsi’s supporters and other dissenters have been killed or remain imprisoned, Kerry delights in informing the general who overthrew Egypt’s only serious experiment in representative democracy that he will get even more sophisticated weapons with which to enforce his hold on power. In the process of consolidating its power, the military has silenced the dissenting voices of Egypt’s Arab Spring, including the bold manifestations of a free press. State financed thugs who shout down any reporters daring to raise unpleasant questions now dominate the Egyptian news media. The basic human rights of assembly and speech unleashed by Egypt’s season of freedom that resulted in Morsi’s election have been snuffed out across the political spectrum. The lesson of Kerry’s visit to the Arab world’s most populous country, bearing the gifts of US military and economic aid, is that the United States is totally hypocritical in making the case for human rights, preferring the rule of a deeply corrupt military elite that will accommodate US prerogatives in the region to the expressions of individual freedom only recently displayed in Egypt. The fact that the lead victims of this suppression, the followers of the Muslim Brotherhood, eschewed violence in favor of peaceful civic organization and the route of elections carries an alarming message that the United States is not seriously committed to nonviolent means of bringing about social change. From Egypt, it was off to Baghdad for Kerry to see whether Iraq’s bold effort in democratic nation building could be resuscitated in the face of imminent collapse. The problem there is that Kerry will have trouble locating a military strongman to back. The nostalgic choice might be someone like Saddam Hussein. He too was a secular military strongman who very effectively controlled religiously motivated parties, but he’s no longer available.